Posted on August 9, 2013 by Karin Shibata Posted in Pâtisserie, Recipes	. Les détracteurs diront que c’est une truffe sans forme de truffe 🙂 ! Bref, voici ma recette avec le meilleur rapport simplicité/temps/résultat. Ohhhh sacrilège, j’ai utilisé du chocolat à 55% pour répondre aux goûts d’amis n’aimant pas le chocolat trop corsé. Mais du chocolat et du cacao en poudre bio de la marque KAOKA ! Merci à mon amie Tina, experte en agriculture biologique de m’avoir fait découvrir cette marque ! Here is a way to modernize the classic chocolate truffles. 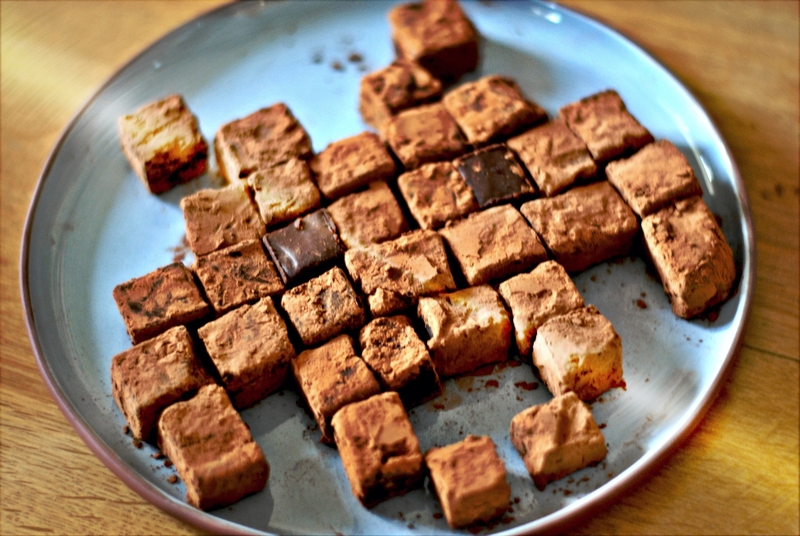 While cutting the cubes, I thought about this artist I love: SPACE INVADER… And to remain pragmatic, it’s also a way to avoid rolling the truffles by hand in round shape… Severe critics would say is a truffle without the shape of a truffle 🙂 ! In short, here is my recipe with the best ratio easiness/time/result. Ohhhh what a sacrilege, I used 55% chocolate for this recipe to meet the tastes of friends who do not like too intense cacao flavor. But it’s KAOKA organic chocolate and cacao power. Thanks to my friend Tina, expert in organic farming for the discovery of this cool brand! 300 g of dark chocolate from 50% to 85% of cacao depending on your personal taste, in pistoles or chopped. Bring the liquid cream, the sugar syrup to boil and your optional ingredient (to remove before next step if it's solid). Pour the cream on chocolate and mix thoroughly with a whisk. Add the butter and mix well. That's it, the ganache is ready! Pour in a square mold. Let stand the ganache overnight, preferably in the fridge. The ganache will gain in texture. Unmold and sprinkle the plate of ganache cocoa cut in small cubes of 1.5 cm on 1,5 cm and roll each cube in the cocoa powder. For an easy unmolding, the ideal is to use below and on the edges a guitar sheet or parchment paper. 300 g de chocolat noir de 50 à 85% selon vos gouts, en pastille ou haché. Porter à ébullition la crème liquide, le sirop de sucre et votre ingrédient optionnel (à retirer avant la prochaine étape si l'ingrédient est solide). Verser la crème sur le chocolat et mélanger intimement au fouet. Ajouter le beurre et incorporer. Et voilà, la ganache est prête! Verser la dans un moule carré ou rectangulaire. Laisser prendre la ganache une nuit, au réfrigérateur. Démouler et saupoudrer la plaque de ganache de cacao. Découper en petits cubes de 1,5cm sur s,5 cm. Et rouler chaque cube dans la poudre de cacao. Pour faciliter le démoulage, l'idéal est d'utiliser dessous et sur les bords une feuille guitare ou du papier sulfurisé. Tags: cacao, space invader, truffe, truffle	. Tu as mon adresse non. ??? Debbie Heffez liked this on Facebook. Nader Mafi liked this on Facebook. Mouloud Achour liked this on Facebook. Arnaud Vallens liked this on Facebook. Benoît Barbero liked this on Facebook. Celia Valeani liked this on Facebook. Noemie Marijon liked this on Facebook. Aurelien Kruse liked this on Facebook. Elaine Lozano liked this on Facebook. TJ Laure liked this on Facebook. Marc-Oliver Mewes liked this on Facebook. Chipeur Le Renard liked this on Facebook. Aurélien Duffo liked this on Facebook. Chung-Leng Tran liked this on Facebook. Roberta Uekermann liked this on Facebook. Huteau Ludivine liked this on Facebook.